I think I would call this a bad luck cupcake day. I'll be the first to say that sometimes my baking does not work out like I pictured in my mind. I mean, does yours? Let me tell you about this little experience and maybe you can learn from my mistakes. First attempt, when you take some beautifully baked cupcakes out of the oven, please make sure your husband turns off the hot plates on the stove top after dinner before placing the cupcakes on it to cool. (That was a long sentence, sorry!) Yes he did leave it on and yes I did burn a whole pan of cupcakes on the hot plate. Doh! I was able to save one pan. Third attempt at 11:00 p.m. A lovely Betty Crocker boxed mix. Don't judge! I was tired. They do look pretty though, don't you think? During all this chaos, I did a couple of color flow pieces. Mario for my little buddy (who is now 6 years old!) 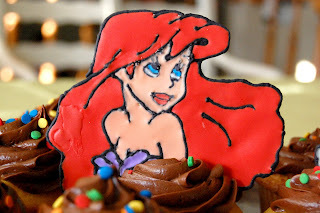 and Ariel for my sweet little niece. She turned 2. These are a little rough, but I think they turned out well. It was a fun little party with lots of family. 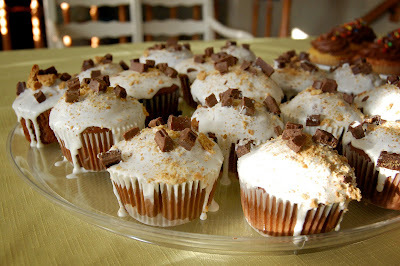 The smores cupcake recipe is from "Cupcakes! From the Cake Mix Doctor". It was okay. I would give it a 2.5. The marshmallow frosting recipe didn't turn out at all. More bad luck I guess. I followed the recipe to a "T". It came out runny and I was expecting fluffy. So I wasn't impressed. 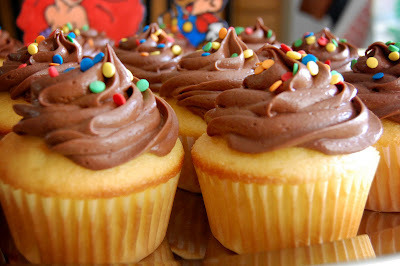 The chocolate frosting was really really good. It is from the same cookbook. It is called Chocolate Syrup Frosting. Loved it. I most definately will use it again. I will post the recipe soon. Oh! To answer all your questions. I bought the little cupcake wrappers from my previous post at Orson Gygi in Salt Lake City. I couldn't find a link but I did find them here on the web. 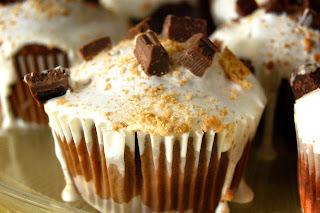 I agree that the marshmallow topping needs to be more fluffy. I think they are still nice looking though and yummy. Great job on both! You are so talented. 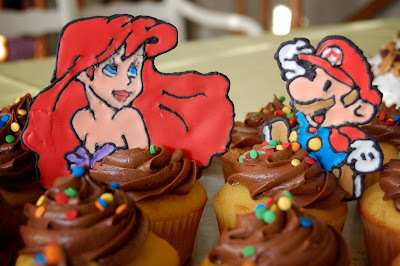 These Birthday Cup Cakes are really awesome, it is always a good idea to celebrate with a cake.